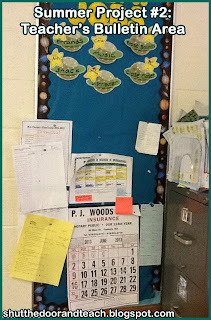 The second installment in my "Summer Project" list is the "Teacher's Bulletin Area." You know, that spot behind your desk where your schedules and meeting calendar dates go so they never get lost on your desk. This space is pretty functional, and by nature I don't think it will ever be attractive. Plus, since it's the only real bulletin board I have (other than 3 closet doors) I have to share my own organizational needs with the job chart board. On the other hand, I think that there are measures I can take to improve this area for next year. 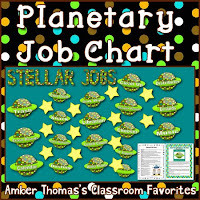 The job chart planets were new last year (I just started selling them on Teachers Pay Teachers), and I like how they go with the Trend stars I get every year for the kids' names. I feel like stars will never go out of fashion, so I'll stick with them! The sparkly gold letters do not fade. They've been there for nearly a decade and still going strong. The shower curtain matches my classroom theme, doesn't fade, and is very durable. It's a keeper. The paperwork on top of the filing cabinet has been a REAL success this year. I might want to create a "cover page" at the very front to hide it a little, but it's been too functional to ditch, even if it's a little cluttered looking. I feel like it's time for an update, in the borders department, even though the planets fit with the job area. I'd like to have a more cohesive look with the borders in my classroom. I may have enough Trend rainbow stars, but I'm really in love with some of the more modern colors to tie in more strongly with my lime green and teal theme that I just recently started selling on Teachers Pay Teachers. I made a Pinterest board JUST for my border loves! Anyone willing to weigh in below in the comment section? I suppose I could divide this section in two by using borders to create a dividing line. Finally, I'm just going to have to promise to really think about what paper work MUST go up there, and which can be tucked into a binder. It's gotten better over the years, but it's still not pretty. I might even want to invest in a prettier calendar (or cover the advertisement) since that one is so conspicuous. This is a taller order, and purely cosmetic! None of this is going to help my fourth graders next year in any way, so if I have to let a project go, you know it's going to be that filing cabinet. We'll see how things go this summer. Hi Amber,just found you tonight through a pinterest pin. 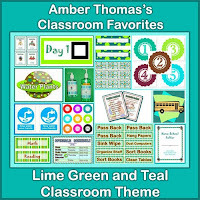 Love the name of your blog, the color combo of teal, lime, and chocolate, and I am your TPT follower #188. I love your Pinterest border board - even though I only have 2 years left before retirement, I have such a love of borders.... what to do when there is no classroom to embellish? Thanks for following! In the end I bought 4 of the borders on that board; Iwas just too torn to decide, hehe. I plan to use the polka dot ones and the paisley will be a "backup." Hi!!!!! 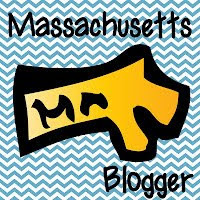 I am just stopping by to tell you that I love your blog and the awesome color combo! 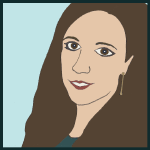 Also, I have nominated you for the Liebster Award which is an award for blogs with less than 200 followers!! Head on over to my blog to read the rules!